Home » Entertainment Graphs • Games » Does Trash Talking Pay Off? Does Trash Talking Pay Off? 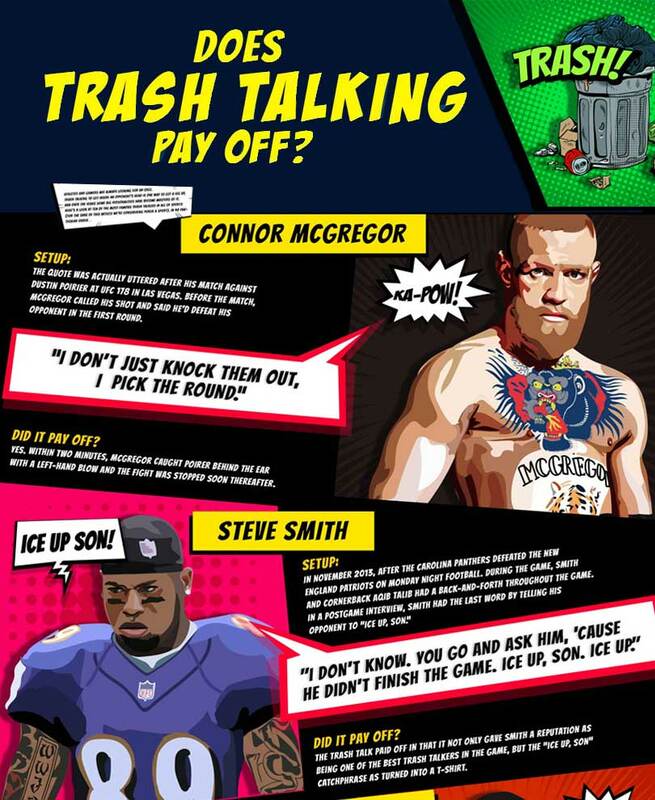 Trash Talk : An insulting or boastful speech intended to demoralise or humiliate a sporting opponent. Verbal intimidation has always been part of the sport because athletes and gamers are always looking for a way to get an edge on the competition. This infographic provided by 888poker include a range of sports, from boxing to American football, to tennis and poker. Trash talk is where the big personalities shine. But to make it work, you need bite as well as bark – and that’s where some sportspeople have excelled, where others have come up short. Before his UFC clash against Dustin Poirier at UFC 118, Conor McGregor said: “I don’t just knock them out, I pick the round.” He won the fight in less than two minutes. At the WSOP event in 2005, poker star Phil Hellmuth said of rival Jim Pittman: “This fricking donkey stuffs $15,000 in with a King-Jack. I mean the guy can’t even spell poker.” It didn’t pay off, as Hellmuth busted a short time later. Finally, John McEnroe – whose rivalry with Ivan Lendl was well-documented – said of his Czech rival: “I’ve got more talent in my pinkie than Lendl has in his whole body.” Unfortunately, Lendl won more head-to-head games against McEnroe – triumphing 21-15.